As expected, the Realms Beyond Kickstarter campaign reached its funding goal today, with three days left to go. With nothing to lose, Ceres have revealed two additional stretch goals. The first goal should be particularly exciting for the Euro-connoisseurs among us. 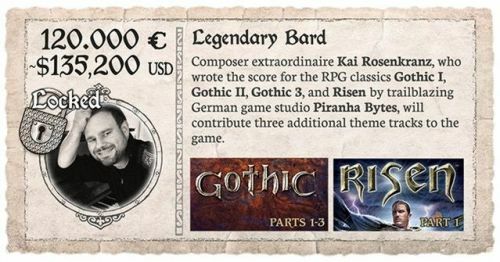 If the campaign manages to raise €120,000, famed Piranha Bytes composer Kai Rosenkranz will contribute three tracks to Realms Beyond's soundtrack. The second one is more traditional. 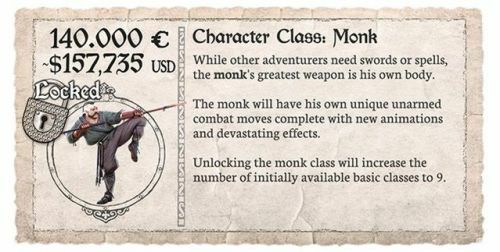 At €140,000, Ceres will add the Monk class to the game. How many stretch goals will they will be able to make in three days? The world map goal is a sure thing. If they make it to the writing team goal, it's just an additional €5,000 for Kai Rosenkranz. Seems doable.